The Xperia X line is decent, but considerably behind competitors from Samsung and LG this year, with prices that border on the astronomical for their features. So what happens when you price your flagship phones too high and nobody buys them? Discounts, baby. Best Buy is already offering the mid-range Xperia X and flagship Xperia X Performance for considerably less than retail, and as unlocked GSM phones, too - no carrier shenanigans to be seen. The Xperia X is being sold by the big box retailer for $429.99, which is $120 off of the retail price. That's the lowest price we've seen yet on the phone, though it doesn't come with the sweet 128GB MicroSD card that BuyDig offered earlier this month. The phone comes in black, white, "lime gold," and "rose gold" (read: pink). The bigger, brawnier Xperia X Performance is $584.99, $115 off of Sony's suggested retail price, and also within a few bucks of the best deal we've seen so far. Colors are black, white, and pink, with no green option. 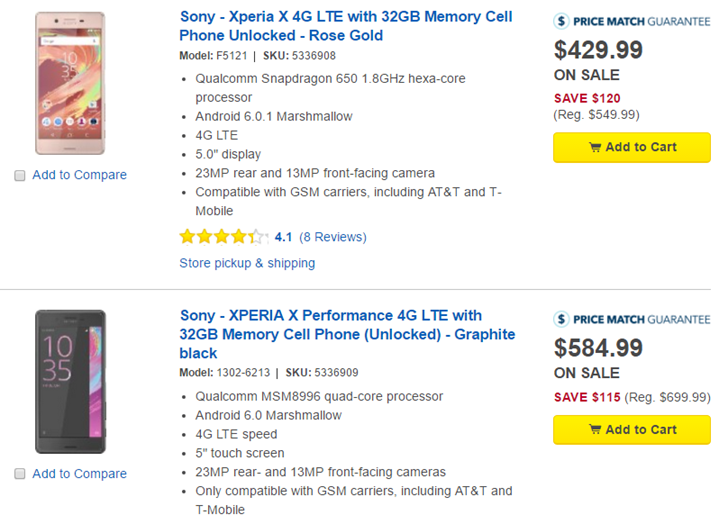 Various flavors of the Xperia XA and the 6-inch Xperia XA Ultra also get less dramatic discounts from Best buy, at $30 and $40, respectively. With these lower prices, Sony's latest designs inch closer to serious consideration in comparison to other phones in the price range. Even so, I'd recommend checking out Ryan's reviews for the Xperia X and Xperia X Performance before pulling the trigger. It's not clear how long the sale prices will last, but shipping is free and in-store pickup at your local Best buy is available for some models.